It's pretty clear that the first thing to go when you're using your gazebo is usually the canopy. 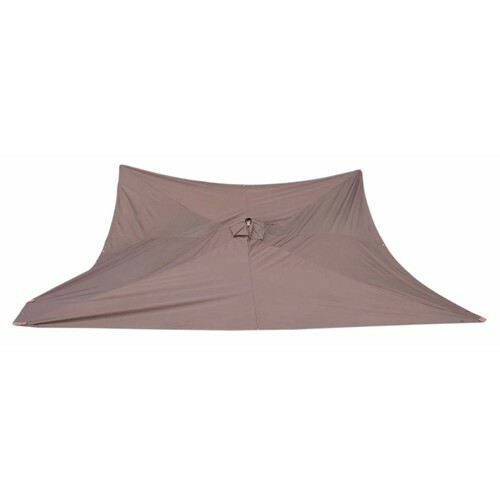 Well, this Allen Roth brown 10 x 10 ft replacement canopy which is made out of uv protected polyester might be something that would fit your structure. This Allen Roth replacement canopy (which is available to buy at Lowes) is made specifically for the Allen Roth 10 x 10 ft gazebo which features a rather Asian approach to design. It's certainly nice to know that when it looks as if your gazebo has seen better days and you start thinking about buying a completely new structure, the only thing you might need to pick up is a new replacement canopy. Not only is it easier to deal with: it's also tremendeously more affordable (this replacement canopy for example is priced at $60 vs. the price of a new structure which would cost you substantially more). Another thing to keep in mind is that it's definitely nicer towards the planet to get a new canopy since then you get more use out of your stuff for a longer period of time. Most companies that make gazebos also make replacement canopies, so if you're in dire need of a new one, then it can be a good idea to first of all check with the store where you bought the structure in the first place. Often it can be tough to fit a model for another gazebo onto your structure, so it's imperative you get one made specifically for your model. Indoor / Outdoor Conclusion: I really like the look of this gazebo, so the canopy is of course nice too. "UV-protected polyester fabric. Easy to install - tools required. Width (Inches): 120.0. Length (Inches): 120.0. Insect Net Included: No. Color/Finish: Brown"